To many people, their first impressions of Hong Kong include glitzy skyscrapers, smartly dressed professionals, and fancy cars. But if that had been the case for me, I wouldn’t have become more drawn to Hong Kong than any other major city. What gives Hong Kong its special flavor are the people that make the city work. 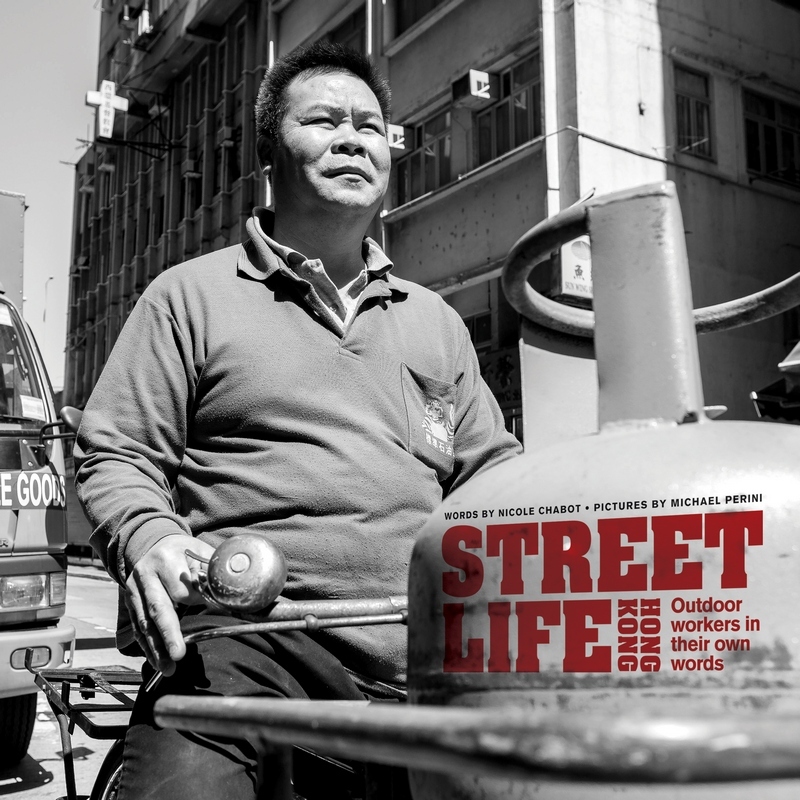 Nicole Chabot’s new book, Street Life Hong Kong (Blacksmith Books, 2014) with photos by Michael Perini, showcases twenty-five people who work outside, many for low wages, in fields like transportation, small commerce, and sanitation, to name a few. I love the many types of transportation in Hong Kong, including the trams and ferries. In this book, Chabot and Perini feature a female tram driver and a male ferry coxswain (captain). They also interview a woman who grew up on a sampan and now takes tourists on sampan rides, as well as a school bus driver. The interviews are presented as first-person narratives, which are lovely and compelling. Other profiles that stood out to me include a Sikh pizza delivery man, a British bouncer, a Cantonese pest exterminator, and a seasonal lifeguard. The sections are broken into different categories: building & environment, transport, wholesale & retail, entertainment, service, and health & safety. The black and white photos are striking and nicely complement the narratives. If you love Hong Kong as much as I do, this is a book not to be missed!